It feels like it’s been a long time since I’ve been excited about watching a show. For perhaps the past year or so, television to me has been all about spoon-feeding the audience the plot, releasing shallow and singular-dimensional characters into the ether, and producing gratuitously sexed-up or violent scenes – because they look good in trailers (do they?). 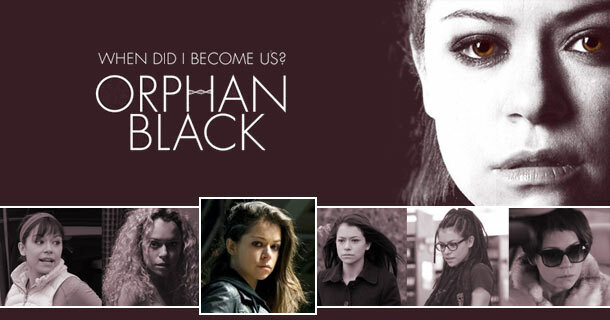 Then a show called Orphan Black found its way into my life, and made me take my boredom of genre shows back. Orphan Black proves that television can still be interesting, intelligent, and exciting. This is now the show that I hang out for every week. This is the show that surprises me, makes me laugh, cry and feel. This is what genre television should be. Orphan Black stars Canadian actress Tatiana Maslany as Sarah, a British hustler returning to the American city (a no-name city that stands in for New York, we assume) where her foster mother Mrs. S (Maria Doyle Kennedy), foster brother Felix (Jordan Gavaris) and daughter Kira (Skyler Wexler) live, after a ten-month disappearance. While trying to reconnect with the people she once knew, she witnesses the suicide of a girl who looks exactly like her. The spookiness wears off quickly, as Sarah retrieves the now dead-girl’s handbag, and realises that this woman is quite well off. Wanting nothing more than to get enough money to take Felix and Kira away, she assumes the identity of the dead girl, intending to steal all her stuff and get out before anyone figures out she’s not the dead girl. The dead girl (whose name is Elizabeth – “Beth”) has a life, a job, a boyfriend (Dylan Bruce), a history that needs answering for, and a second, bright pink mobile that keeps ringing. The opportune moment to take the money and run being pushed further and further into the future, Sarah continues to pretend she’s Beth, while evading her (Sarah’s) er…troubled ex-boyfriend Vic (Michael Mando), trying to show Mrs. S that she’s responsible enough to gain custody of Kira, and trying to figure out the mystery of the Beth with her foster brother Felix, or “Fee” as she calls him – who is adorable and potentially best character ever written. If you read anything about this show online, you’ll find out straight away that it’s about clones, so I don’t consider it a spoiler to say that. Sarah finds out that Beth wasn’t the only one who looked like her. There are many who look like her, from all over the world, with different personalities and leading very different lives to hers. The realisation that they are clones pushes them together as they try to unravel if their entire lives are a lie, a game, or an experiment gone wrong. The reason that it’s important to explain about the cloning is that it leads to the gushing I’m about to do for Ms Tatiana Maslany. She is possibly the most brilliantly subtle and talented actress I’ve ever seen and if nothing about the show’s story interests you, you should watch it purely to see how brilliant she is. Not only does she give Sarah, Beth, and Sarah-pretending-to-be-Beth believably different personalities, but she also does the same for the other clones as they pop up – the snotty Alison; the brilliantly clever Cosima (possibly my favourite clone, who is definitely channeling Summer Glau at times…), the psychotic crusader Helena, and the confused but rocking Katja. On top of that, she then manages to make the other clones pretending to be other versions of themselves (Alison pretending to be Sarah, Helena pretending to be Beth) beautifully, again subtly different! Orphan Black has a strong Dollhouse vibe, so if you were a fan of it, you’ll be a fan of this. An intriguing, multi-layered story is being laid out for us, and I can’t wait to see what happens next. I haven’t been able to say that for a long time. The DVD of season 1 will be out on 16 July 2013, and it’s available in either standard definition or Blu-ray via Amazon. Until then, it’s on iTunes (the US store) and if you’re in the US, it’s on Saturdays at 9pm/8c on BBC America.